happy halloween! love that video! and he has such a unique look. such a hottie, i would. For a brief encounter in the evening, i choose the tattoo version. The video is very interresting, I love the all messange from it. this was an awesome post, i have always wondered what he looked him underneath all those tattoos! i for one could never do that to myself, but that is just who he is now! This photo is so cool. We love the artwork. Its a bit creepy. 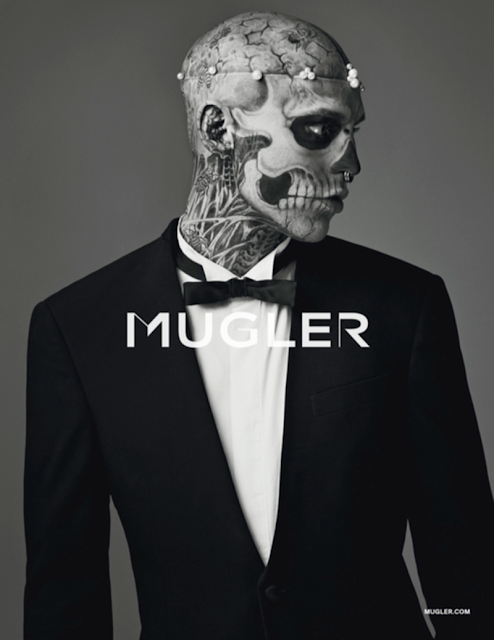 I adore Rick Genest! When I first saw a picture of him, I honestly thought the tattoos were just makeup. Once I found out they were real, I admired his commitment to turning himself into a work of art. He's like a walking, breathing, form of performance art, in my opinion. Absolutely amazing! I didn't know of Rick Genest before, but now I'm intrigued. I have googled him, and I to say I thought those tattoos were makeup like Heidi Klum's Halloween Party costume! Crazy! Wow, I HAVE been wondering what he looks like without all those tattoos. He's quite attractive, but I definitely think his tattoos are his selling point. Thanks for dropping by, and great blog. Shall we follow each other? serving to guard the United States http://jeuj.eu/ we have collected eleven different responses from personal finance bloggers and lenders. Tip 3: Be honest about your car or truck's real condition http://paydayloansonline1.co.uk/ you can find mostly several varieties of personal loan which are the following1.